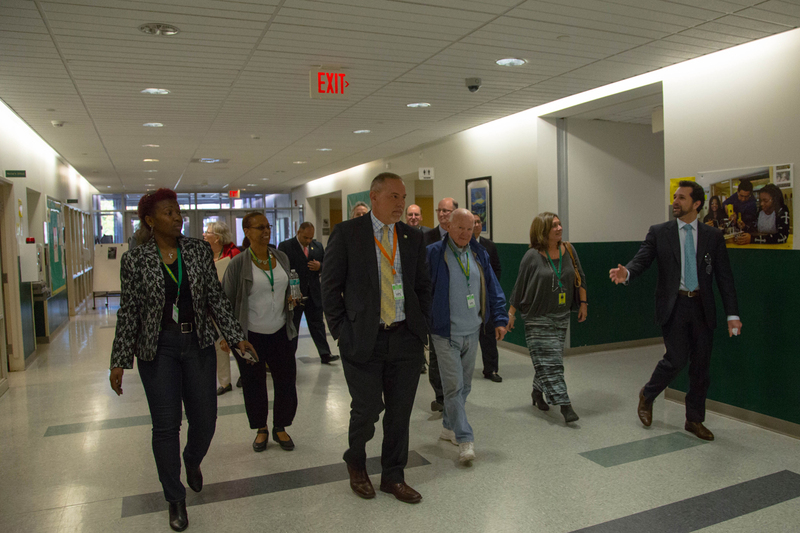 State Representative Mike D’Agostino (D-Hamden) and Representative Robyn Porter (D-New Haven/Hamden) coordinated a visit for legislators to the Hamden Church Street Elementary School and the Hamden Middle School. They were joined by Majority Leader Joe Aresimowicz (D-Berlin), Rep. Toni Walker (D-New Haven), House Chair of the Appropriations Committee, and Sen. Joe Crisco (D-Woodbridge). Rep. D’Agostino explained that the purpose of the visit was to see how the district is creatively and effectively spending state education funds, especially Alliance District money. Hamden has received about $4 million each year in additional Alliance funds since 2012. Those funds are set to expire at the end of this fiscal year (June 30, 2017), unless renewed by the State. Hamden has used those funds to establish several innovative and interlinked programs at the elementary through high school level. The programs build on each other. At Church Street school, for example, the Alliance funds support a before school learning program for at risk students, as well as math, literacy specialists, a social worker and school psychologist and behavioral intervention programs designed to reduce school discipline incidents. The results have been dramatic. Church Street has seen a 60% decrease in school suspensions and an increase in students reaching goal or above in reading from 24% to 58% in the past two years. At the middle school, these programs expand to the Navigator and Pioneer programs. Across the district, Alliance funds also pay for before and after school programs, mental health staff (social workers and psychologists) STEM (Engineering and Computer Science courses) as well as summer reading programs (using Kindle readers for students). Overall, Hamden has achieved a remarkable 40% reduction in school discipline events from 2012 to 2016 and seen an increase in reading scores district wide.